By providing liquidity to credit line borrowers and depositors, banks are potentially exposed to simultaneous runs on their assets and liabilities. This risk became a reality when the European interbank market froze in the summer of 2007. This column discusses the risk of double-bank runs, liquidity risk management by banks and the implications for the regulation of the financial sector, in particular Basel III. In 2007, banks with a larger exposure to the interbank market suffered a spike in drawdowns on their outstanding credit lines to firms, and were effectively exposed to a ‘double-run’. Importantly, this fragility was mitigated by active pre-crisis liquidity risk management by banks. The financial crisis that started in 2007 was centred on wholesale liquidity problems at financial institutions. This was in stark contrast with previous financial crises in history, where bank runs were mainly coming from retail depositors (Gorton and Metrick 2012, Freixas et al. 2015). The financial crisis hit European markets on 9 August 2007 when the interbank market dried up. At this time, banks that relied more on interbank funding suffered a severe liquidity shock to the liability-side of their balance sheet. To make things worse, as we show in a recent paper based on Italian data, in the fear of a forthcoming restriction of credit, borrowers increased their drawdowns on their outstanding credit lines, thereby leading to a double squeeze on the balance sheet of banks: non-financial firms requested more liquidity precisely when funding liquidity for banks was becoming more scarce (Ippolito et al. forthcoming). Considering that Italy did not have a credit and a real estate bubble, the quantitative results of the paper should be regarded as a lower bound as compared to the US (Ivashina and Scharfstein 2010) and to other European countries such as the UK, Ireland and Spain. Before August 2007, spreads on unsecured interbank lending had remained stable at very low levels for several years. 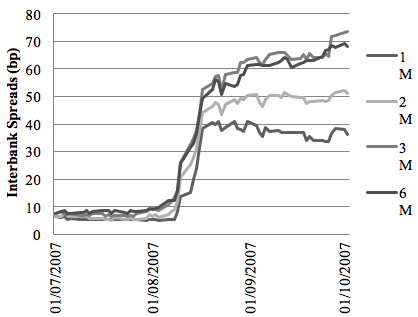 In August 2007, interbank spreads increased significantly, as shown in Figure 1. The interbank market dried up on 9 August, which led the ECB to inject almost €100 billion in liquidity into the system on that day. However, in 2007 the ECB did not provide fixed rate full allotment liquidity, which only became available in October 2008, a couple of weeks after the collapse of Lehman Brothers. The 2007 crisis originated in the US and was triggered by the exposure of investors to subprime-related securities. The crisis spread to the European markets when this subprime exposure led BNP Paribas to suspend redemptions from three of its investment funds (Brunnermeier 2009). This event caused a shock to the European interbank market. After the shock to the European interbank market, the aggregate withdrawals in the interbank market were approximately 22%, and even larger for banks with greater borrowings from the interbank market. At this time, there was a sharp increase in drawdowns on credit lines by borrowers. Between June and September 2007, the average increase of the drawdown amount on outstanding credit lines to non-financial firms was in the range of 16.70%. During this period the increase in new credit lines granted to firms was close to zero, which indicates that the increase in the ratio of drawn credit lines over granted credit lines came entirely from drawdowns by borrowers, not from a drop in granting credit by lenders. A key question is whether during the crisis drawdowns were larger for banks that were more exposed to the interbank market. The richness of the Credit Register of the Bank of Italy allows us to look at multiple credit lines that are extended simultaneously to one firm by different banks. The fact that simultaneous credit lines are common practice in Italy allows us to control for both observable and unobservable firm characteristics. We can then test whether firms with multiple credit lines from different banks draw down more from the banks with higher interbank funding. This would be evidence that firms run on banks with a more fragile liability structure. Our results confirm this hypothesis. We find that higher pre-crisis interbank exposure was associated with larger drawdowns during the crisis. Drawdowns on banks with higher interbank exposure were stronger from more leveraged and smaller firms, and for less liquid and smaller banks. In essence, during the crisis we not only observed double bank runs, but these runs were relatively stronger for financially constrained firms and banks. Why did the run on credit lines occur? Our evidence suggests that the run on credit lines was driven by the fear that banks with higher interbank exposure would restrict the supply of credit to firms. There was no credit supply restriction immediately after the shock in August, but in the following months, banks with higher pre-crisis interbank funding tightened the supply of loans to new applicants relatively more than other banks. We show this by looking at firms that simultaneously applied for loans to multiple banks (thus isolating the supply of credit) in the last quarter of 2007. Risk management: Did banks foresee this risk? Apparently yes. If one aggregates the drawdowns at the bank level, the picture that emerges is that banks with higher interbank funding did not suffer higher drawdowns than the average bank. This may seem in apparent contradiction with the statement that firms with multiple credit lines draw more from banks with higher interbank exposure. However, it is not. This has to do with how banks and firms are matched. One way to read the above results is that banks with higher funding from the interbank market are aware of the risk of double runs, and actively manage this risk by offering credit lines to borrowers that, conditional on both unobservable and observable characteristics, are less prone to draw down in crisis times. Indeed, this is what we find. Conditionally on granting a line, banks with a larger exposure to the interbank market offered lower amounts. Our results suggest that banks manage the risk of double runs by offering credit lines selectively to borrowers, in a manner that mitigates the cross-sectional effect of drawdowns during the crisis. Interestingly, banks seem to start managing this risk in the run-up to the crisis, as we find weaker evidence of selective provision of credit lines to weaker firms in the first quarter of 2007 and in the last quarters of 2006. A key component of the new Basel III framework is the introduction of liquidity requirements, which penalise both the provision of credit lines and interbank funding. We now know that both items are subject to runs, simultaneously. This reinforces the idea that the new liquidity requirements for credit lines and interbank funding are important. Our findings suggest that prudential supervision should rely on extensive micro data on credit lines, since these are critical to assess the extent to which banks actively manage liquidity risk. Brunnermeier, M. (2009), “Deciphering the liquidity and credit crunch 2007-08”, Journal of Economic Perspectives 23, 77-100. Freixas, X., Laeven, L., Peydró, J.L. (2015), Systemic risk, crises and macroprudential policy. MIT Press, Boston, MA. Gorton, G., Metrick, A. (2012), “Securitized banking and the run on repo”, Journal of Financial Economics 104, 425-451. Ippolito, F., Peydro, J.L., Polo, A., Sette, E. (2016), “Double bank runs and liquidity risk management”, Journal of Financial Economics, forthcoming. Ivashina, V., Scharfstein, D. (2010), “Bank lending during the financial crisis of 2008”, Journal of Financial Economics 97, 319-338.